This Killer Clown Creeper Wall Decor is 15.5" tall, 13.5" long and 7" deep approximately. 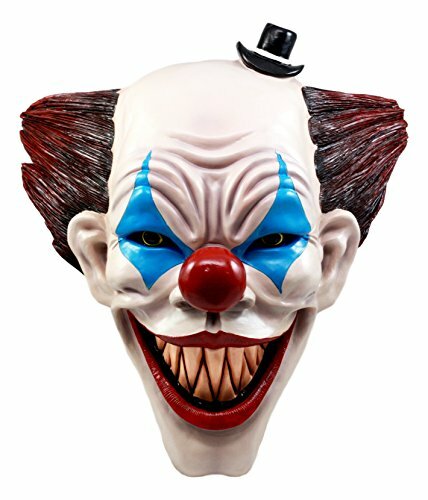 This Killer Clown Creeper Wall Decor is made of designer composite resin and fiberglass, hand painted and polished. Color Tone may vary. Screws not included. Anchored screws recommended during install. Stop your friends dead in their tracks with this fearsome Killer Clown Creeper Boogeyman. This paranormal being comes to earth every 50 years to haunt people all over the world. Don't look because if you do, you will be having nightmares. His creepy eyes will hypnotize you and those sharp fanged teeth is ready to feast! This Killer Clown Creeper Wall Decor is 15.5" tall, 13.5" long and 7" deep approximately. Screws not included. Anchored screws recommended during install. Stop your friends dead in their tracks with this fearsome Killer Clown Creeper Boogeyman. This paranormal being comes to earth every 50 years to haunt people all over the world. Don't look because if you do, you will be having nightmares. His creepy eyes will hypnotize you and those sharp fanged teeth is ready to feast!